Background: Studies have shown that Integrated Yoga reduces pain, disability, anxiety and depression and increases spinal flexibility and quality-of-life in chronic low back pain (CLBP) patients. Objective: The objective of this study was to compare the effect of two yoga practices namely laghu shankha prakshalana (LSP) kriya, a yogic colon cleansing technique and back pain specific asanas (Back pain special technique [BST]) on pain, disability, spinal flexibility and state anxiety in patients with CLBP. 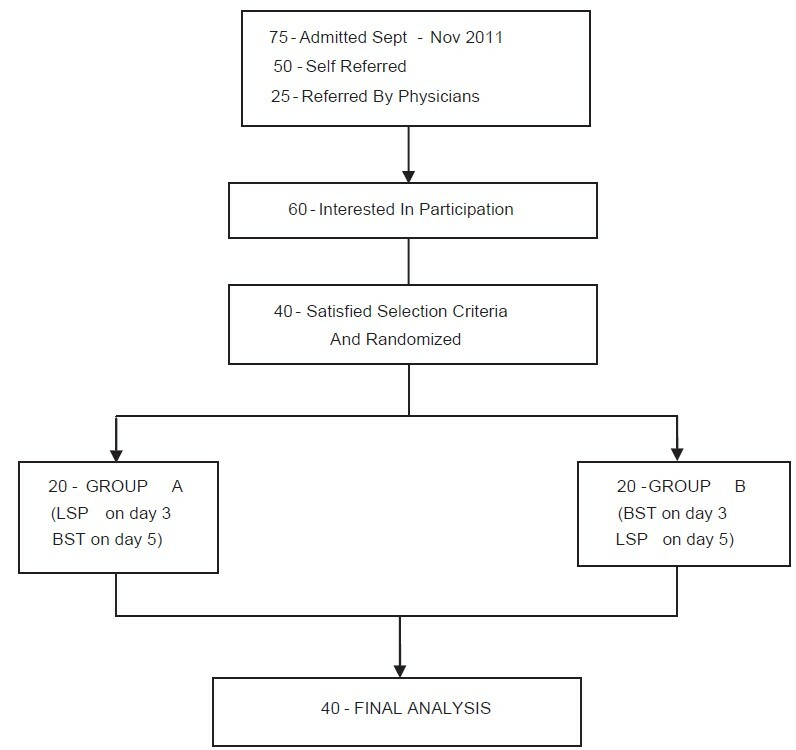 Materials and Methods: In this randomized control (self as control) study, 40 in-patients (25 were males, 15 were females) between 25 and 70 years (44.05 ± 13.27) with CLBP were randomly assigned to receive LSP or BST sessions. The measurements were taken immediately before and after each session of either of the practices (30 min) in the same participant. Randomization was used to decide the day of the session (3 rd or 5 th day after admission) to ensure random distribution of the hang over effect of the two practices. Statistical analysis was performed using the repeated measures analysis of variance. Results: Significant group * time interaction (P < 0.001) was observed in 11 point numerical rating scale, spinal flexibility (on Leighton type Goniometer) and (straight leg raise test in both legs), Oswestry Disability Index, State Anxiety (XI component of Spieldberger's state and trait anxiety inventory. There was significantly (P < 0.001, between groups) better reduction in LSP than BST group on all variables. No adverse effects were reported by any participant. Conclusion: Clearing the bowel by yoga based colon cleansing technique (LSP) is safe and offers immediate analgesic effect with reduced disability, anxiety and improved spinal flexibility in patients with CLBP. In our earlier studies on CLBP, we used an integrated module of yoga therapy that included selected Asanas, Pranayama, meditation and healthy life-style program. It is said by Patanjali Maharishi that all these yoga practices are meant to have a common end point, i.e., mastery over the modifications of the mind (Chitta Vrtti Nirodhah), which is the state of mind required for healing mind body diseases. Yoga emphasizes the value of clearing the bowel before preparing for any practice and has evolved several colon cleansing techniques (Shankha Prakshalana, Basti etc). These are a part of a broad category of practices called Kriyas that offer mastery over the mind in conformity with the definition of yoga and also have a therapeutic role. In our pilot studies during the routine yoga therapy courses for CLBP at the residential health home, many patients had reported a good feeling with pain reduction and better flexibility soon after clearing the bowel through a colon cleaning technique called Laghu Shankha Prakshalana (LSP). Although, studies have shown the beneficial effects of selected Asanas combined with relaxation  or integrated yoga  in reducing chronic pain or anxiety or depression, there is no study to date that has looked at the effect of yogic cleansing techniques on LBP. Hence the present study was planned with the objective of comparing the immediate effect of LSP with an active session of back pain specific asanas in patients with mechanical CLBP with the hypothesis that, immediately after the practice of LSP, the spinal flexibility would increase with reduction in pain, disability and anxiety. A total of 40 CLBP patients were admitted to a yoga therapy health home for in-patient treatment who satisfied the selection criteria were recruited for the study. Statistical calculation using G* power software version 3.0.10 (Erdfelder, Faul, and Buchner, 1996, Department of Psychology, Germany)yielded a sample size of 20 for an effect size (ES) of 1.5 (calculated from previous studies on yoga and LBP) with an alpha at 0.05 powered at 0.8. The inclusion criteria were: (a) history of CLBP of more than 3 months,  (b) pain in the lumbar spine with or without radiation to legs  and (c) age between 25 and 70 years. Exclusion criteria were:(a) CLBP due to organic pathology in the spine such as malignancy (primary or secondary), or chronic infections checked by X-ray of the lumbar spine, (b) severe degree of pain, (c) recommended surgical intervention, (d) severe obesity, (e) chronic cardio-pulmonary illnesses, and (f) women during their menstruation or pregnancy. The study was approved by the institutional review board and the Ethical Committee of the University. Signed informed consent was obtained from all participants. In this self as control study, 40 participants who satisfied the selection criteria were allotted to two groups by a computer generated random number table (www.randomizer.org). Numbered opaque envelopes were used to implement the random allocation to conceal the sequence until the day of the intervention was assigned. All 40 subjects were assessed on two occasions (3 rd and 5 th day) before and after the practice of either LSP or the active control intervention, the BST (Back pain Special Technique) Two groups (group A and B) randomization table was used to allocate subjects to the two interventions on the 3 rd or 5 th day after admission to ensure random distribution of the hang over effect of the two sessions. Demographic details, vital clinical data, personal, family and stress history were documented before starting the intervention on the 1 st day. All subjects were taught the integrated yoga module as in our earlier studies. ,,,, It was ensured that all had learnt the back pain special technique (BST) within 3 days after admission before they were taken up for the experimental session. Group A was taken for the experiment on LSP on the 3 rd day and BST on 5 th day while group B was taken for BST on the 3 rd day and LSP on the 5 th day after admission. Outcome variables were recorded immediately before and after the sessions on the 3 rd and 5 th day. As this was an interventional study the subjects and the therapists could not be blinded to the type of intervention. The researcher who carried out the assessments and the statistician, who randomized and analyzed data, were blind to the subject's group. After completion of this study, the psychologist scored the coded answer sheets of the questionnaires. 0Standard procedure of LSP that formed an integral part of integrated approach of yoga therapy (IAYT) for CLBP  was formulated using the concepts from traditional yogic scriptures  and contemporary yoga manuals of Bihar school of yoga  and S-VYASA. Both practices were taught by certified post-graduate yoga therapists. A physician trained in yoga was available for supervision. About 2 L of Luke warm saline (about 1% of sodium chloride) water is kept ready before starting the session. The participant dressed suitably is taken to the venue specially designed for the practice of LSP. The subject sits comfortably in a chair and drinks two glasses of water (about 100 ml/glass). After drinking, a series of five specific βsanas (Tβḍβsana [palm tree pose], Tiryanktβḍβsana [swaying palm tree pose], Kaṭi cakrβsana [waist rotating pose], Tiryanka bhujaṅgβsana [twisting cobra pose] and Udarβkar?aṇasana [abdominal stretch pose]) are repeated 5-10 times each  under the guidance of the instructor. If the participant gets the urge to empty the bowel in between the practices he/she is permitted to rush to the toilet and empty the bowel. If he/she does not get the sensation, the cycle of drinking water followed by the practice of five asanas is repeated (a total of three cycles only) until he/she gets the urge. If they failed to get the urge within three cycles then the practice is abandoned and planned to try the next day. Although it was planned that those who did not succeed on the first attempt would be dropped out of the study, there were no drop outs as all of them succeeded in completing the procedure with a good feeling of clearence of the bowel. After the practice, the participant is taken for a deep relaxation technique (DRT). BST, used as part of the module of IAYT for CLBP, incorporates simple yogic movements [Table 1] followed by maintenance in the final posture of selected Asanas that provide stretch and relaxation. The safety of the practices was ensured by avoiding acute forward or backward movements of the spine or jerky movements while designing the module  these practices were followed by DRT. All measurements were recorded immediately before and after both the sessions (LSP and BST) on the 3 rd and 5 th day. Section 1 of the revised ODI for LBP (ODI), , a self-administered questionnaire, was used. This section of ODI provides measures of pain intensity with 5 graded questions for assessing the degree of pain in 10 different activities of living such as walking, standing, social life, etc. Test-retest reliability of ODI is high, ranging from 0.83 to 0.99. It has good construct validity and Cronbach alpha ranges from 0.71 to 0.87. Pain intensity numerical rating scale , is an analog scale that has a 10 centimeter line drawn on a plain sheet of white paper with eleven dots (0-10) marked as no pain at "0" and worst possible pain at 11 th dot. This self-reported inventory , comprises two components, i.e., X1 for measuring state anxiety and X2 for trait anxiety. In the present study, STAI X1 was used to measure the immediate effect of the practice. This consists of twenty statements that evaluate how the participant feels "right now, at this moment." In responding to the state anxiety scale, the participant chooses the alternative that best represents the intensity of their feelings: (1) not at all, (2) somewhat, (3) moderately, (4) very much so. Each STAI item is given a weighted score of 1-4. STAI has concurrent validity ranging from 0.75 to 0.80 with other tests. The overall median co-efficient alpha is 0.92. Spinal mobility  was measured using Leighton type goniometer (Anand Agencies, Pune, India). This instrument is tied around the waist and has a dial with a calibration from 0° to 360°. The values for the range of the movement during forward and backward bending are observed on the dial and recorded in degrees. Spinal flexion was measured by SLR test using a caliper type goniometer (Anand Agencies, Pune, India), which comprises of 2 cm scales fixed at an axis with a compass (calibrated in degrees) fixed at this point. Participant is made to lie down on the couch comfortably and placed next to the body with the center of axis at the tip of the greater trochanter and the stationary arm resting on the couch. The other arm of the caliper is held by the examiner along the lateral midline of the thigh. The participant's leg is raised passively by the examiner, up to a point where the patient starts experiencing pain. The angle between the two scales is read off on the compass and recorded in degrees. The same procedure is repeated on both sides. The data were analyzed using SPSS (Statistical Package for Social Sciences), version 18.0 (IBM corporation). Statistical tests used included Kolmogorov-Smirnov's test for normality of baseline data, independent samples "t" to check for baseline matching of the groups and repeated measures analysis of variance (repeated measures ANOVA) to compare the means within and between groups. ESs were also calculated. [Figure 1] shows the study profile. There were no drop outs in this study that recruited 40 participants. [Table 2] gives the details of the socio-demographic and medical characteristics. The baseline data were normally distributed for all variables. There were 25 males and 15 females. The age range was 27-66 with mean and standard deviation of 44 ± 13.27. No adverse events were observed/reported during or after the practices in any of the participants. [Table 3] and [Table 4] show the results of all variables. There was a significant interaction between intervention and time (F (1,39) =32.11, P = 0.001) for section 1 of ODI. There was a significant difference within the two groups. The ODI for the LSP group significantly reduced (F (1,39) =58.78, P = 0.001), which was not significant in the BST group (F (1,39) =0.22, P = 0.001). There was a significant interaction between intervention and time (F (1,39) =17.00, P = 0.001) for NRS. NRS show. The changes after LSP (F (1,39) =176.38, P = 0.001) was higher (ES in LSP 1.81 vs. ES in BST 0.85) than in BST group, which was (F (1,39) =0.05, P = 0.001). STAI-XI showed a significant reduction of state anxiety with significant interaction between intervention and time (F (1,39) =2.86, P = 0.001). The changes after LSP (F (1,39) =, P = 0.001) was higher (ES in LSP 0.90; in BST 0.53) compared with BST group (F (1,39) =0.294, P = 0.001). There was a significant interaction between intervention and time for Spinal flexion (F (1,39) =31.38, P = 0.001). The Spinal flexion for LSP group significantly increased (F (1,39) =34.25, P = 0.001) (ES in LSP 1.11; in BST 0.25), which was not significant in the BST group (F (1,39) =1.35, P = 0.001). There was a significant interaction between intervention and time for Spinal extension (F (1,39) =18.29, P = 0.001). The Spinal extension for LSP group significantly increased (F (1,39) =13.02, P = 0.001) (ES in LSP 0.83; in BST 0.05), which was not significant in the BST group (F (1,39) =0.96, P = 0.001). There was a significant interaction between intervention and time for Right lateral flexion (F (1,39) =3.29, P = 0.001). The Right lateral flexion for LSP group significantly increased (F (1,39) =22.78, P = 0.001) (ES in LSP 1.13; in BST 0.28), which was not significant in the BST group (F (1,39) =1.28, P = 0.001). There was a significant interaction between intervention and time for Left lateral flexion (F (1,39) =5.50, P = 0.001). The Left lateral flexion for LSP group significantly increased (F (1,39) =33.90, P = 0.001) (ES in LSP 0.70; in BST 0.09) which was not significant in the BST group (F (1,39) =0.36, P = 0.001). SLR test using a scale type of goniometer showed significant interaction between intervention and time (P = 0.001) (F (1,39) =19.20, P = 0.001). The Left lateral flexion for LSP group significantly increased (F (1,39) =52.81, P = 0.001) (ES in LSP 0.89; in BST 0.38), which was not significant in the BST group (F (1,39) =0.71, P = 0.001). This was a single blind randomized self as control study with cross over feature, that compared the immediate effect of two yoga techniques, on 40 participants with CLBP. Results were showed significant group * time interaction (P < 0.01, Repeated Measures ANOVA) with better improvement after LSP than BSP on all variables. Peripheral factors that are responsible for CLBP include muscle spasm and local inflammatory responses. Leask and Abraham observed that mechanical, emotional, behavioral and motor dysfunction in CLBP may result in inflammation and fibrosis in addition to spasm and wasting, that could be traced to tissue hypoxia, lowered Ph and release of cytokines such as transforming growth factor beta-1. It is proposed that yoga reduces paraspinal muscle spasm and inflammation during BST and LSP through deep local rest and relaxation that follows safe stretches done with awareness. How does bowel cleansing work? The clinicians of yoga and ayurveda (5000 years ago) observed that LBP is usually associated with disturbed bowel functions (constipation or IBS Irritable Bowel Syndrome) and proposed that this is a manifestation of uncontrolled excessive locked up flow in the local Prana control structures called Chakras. Chakras are vortices of Prana, which seem to operate through the major nerve plexi,  that monitor and control the flow of Prana in six zones of the body starting from vertex (Sahasrara Chakra) to sacrum (Muladhara Chakra). The lowest of the seven vortices, the "root center," situated at the base of the spine (Muladhara Chakra) controls the physiological functions in the lower zone of the trunk including all involuntary (e.g., defecation) and voluntary functions (Paraspinal and perennial muscles). Thus, it is proposed that CLBP is a manifestation of dysfunction of Muladhara Chakra. LSP clears the bowel by activating the peristaltic reflex by a combination of specific physical postures (Asanas) that are designed to release the locked up Prana in this Chakra. The DRT that follows the practice of LSP (essential component after any Kriya) contributes to mastery over the local neuromuscular reflexes through internal awareness and releases the spasm of para-spinal muscles. BST also has similar balancing effect on the Prana and uses safe movements to develop this mastery. Thus, it appears that LSP offers a greater degree of pain relief than BST by the added bowel clearing effect. Both yoga practices, namely yoga based physical postures (BST) and yoga based colon cleansing (LSP) have beneficial effects immediately after the practice in patients with CLBP. The LSP is better than BST in reducing pain, disability and anxiety and also in increasing flexibility. To the best of our knowledge, this is the first study that has looked at the immediate effect of LSP in CLBP and shown significant results in all variables including subjective (pain and disability) and objective measures (spinal flexibility). The novel aspect of the design of this study was: (a) the self as control design, and (b) incorporation of randomization and blinding. There were a few limitations of the study: (a) The study compared two specific yoga practices and there was no neutral control session. (b) As the study was planned to observe only the immediate effects on CLBP, it does not answer the question of long term effect of LSP on CLBP. (c) Although we did not observe any subject with aggravation of pain after the practice during our study, it may be argued that the yoga practices used during the standard way of performing LSP have the potential to aggravate the pain. Hence, we had to select only those patients with moderate to mild pain in an indoor setting of a yoga university and monitored the practices carefully by expert trainers with medical supervision. Therefore, the conclusion from this study may not be universally applicable to all cases of LBP. There is a need to evolve simplified versions of LSP. Future studies may be designed to look at the long-term benefits of LSP. Considering that this is the first study that has pointed to the beneficial effects of LSP in pain management, it is necessary to design studies to compare LSP with simpler methods of bowel cleansing through enemas or simpler laxatives as control interventions. This study is a pointer to the immediate analgesic effect of LSP. When the result of this study gets established through more RCTs with larger sample sizes by other researchers, it would be very important evidence to the knowledge that cleansing the bowel is essential in pain management, which is strongly recommended in most CAM therapies such as yoga and Ayurveda. Based on the observation of this study, we recommend that "regular bowel clearing" may be included as an important vital parameter in the daily nursing procedures in all cases of acute and chronic pain. We are grateful to Dr. Pradhan B and Amrit R who helped with data management and statistical analysis. We thank all the staff of S-VYASA for their cooperation in conducting the program, and our special thanks to Dr. Barve V, Mr. Singh D and Mr. Saraf G for technical assistance. 1. Hoy D, March L, Brooks P, Woolf A, Blyth F, Vos T, et al. Measuring the global burden of low back pain. Best Pract Res Clin Rheumatol 2010;24:155-65. 2. Dunn KM, Jordan K, Croft PR. Characterizing the course of low back pain: A latent class analysis. Am J Epidemiol 2006;163:754-61. 3. Tamcan O, Mannion AF, Eisenring C, Horisberger B, Elfering A, Müller U. 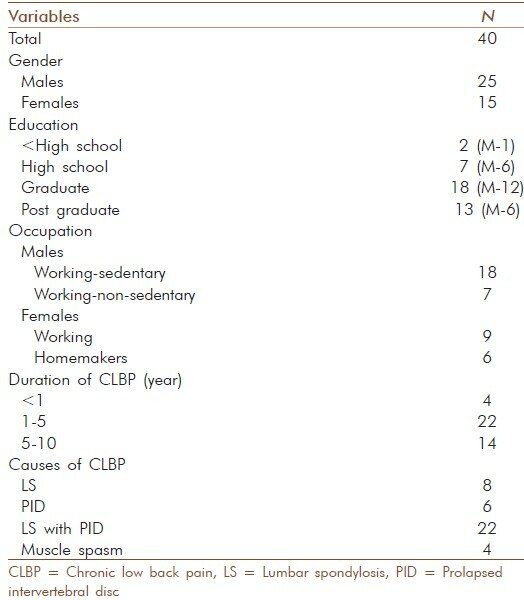 The course of chronic and recurrent low back pain in the general population. Pain 2010;150:451-7. 4. Jordan KP, Kadam UT, Hayward R, Porcheret M, Young C, Croft P. Annual consultation prevalence of regional musculoskeletal problems in primary care: An observational study. BMC Musculoskelet Disord 2010;11:144. 5. Fleming S, Rabago DP, Mundt MP, Fleming MF. CAM therapies among primary care patients using opioid therapy for chronic pain. BMC Complement Altern Med 2007;7:15. 6. Hsu C, Bluespruce J, Sherman K, Cherkin D. Unanticipated benefits of CAM therapies for back pain: An exploration of patient experiences. J Altern Complement Med 2010;16:157-63. 7. Pandey A, Tripathi P, Pandey R, Srivatava R, Goswami S. Alternative therapies useful in the management of diabetes: A systematic review. J Pharm Bioallied Sci 2011;3:504-12. 8. Williams AC, Nicholas MK, Richardson PH, Pither CE, Justins DM, Chamberlain JH, et al. Evaluation of a cognitive behavioural programme for rehabilitating patients with chronic pain. Br J Gen Pract 1993;43:513-18. 9. Sherman KJ, Cherkin DC, Erro J, Miglioretti DL, Deyo RA. Comparing yoga, exercise, and a self-care book for chronic low back pain: A randomized, controlled trial. Ann Intern Med 2005;143:849-56. 10. Williams K, Abildso C, Steinberg L, Doyle E, Epstein B, Smith D, et al. Evaluation of the effectiveness and efficacy of Iyengar yoga therapy on chronic low back pain. Spine (Phila Pa 1976) 2009;34:2066-76. 11. Tekur P, Chametcha S, Hongasandra RN, Raghuram N. Effect of yoga on quality of life of CLBP patients: A randomized control study. 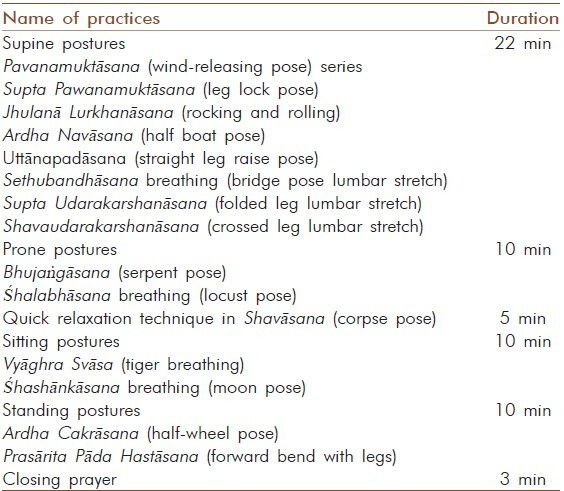 Int J Yoga 2010;3:10-17. 12. Tekur P, Singphow C, Nagendra HR, Raghuram N. Effect of short-term intensive yoga program on pain, functional disability and spinal flexibility in chronic low back pain: A randomized control study. J Altern Complement Med 2008;14:637-44. 13. Satyananadasaraswati S. Four Chapters on Freedom. 3 rd ed. Munger, Bihar, (India): Yoga Publication Trust; 2004. p. 25-60. 14. Satyanandasaraswati S. Asana Pranayama Mudra Bandha. 4 th ed. Munger, Bihar (India): Yoga Publications Trust; 2004. p. 485-99. 15. Williams KA, Petronis J, Smith D, Goodrich D, Wu J, Ravi N, et al. Effect of Iyengar yoga therapy for chronic low back pain. Pain 2005;115:107-17. 16. Merskey H. Classification of chronic pain. Descriptions of chronic pain syndromes and definitions of pain terms. Prepared by the International Association for the Study of Pain, Subcommittee on Taxonomy. Pain Suppl 1986;3:S1-226. 17. Spitzer WO. LeBlanc. Dupic M. Scientific approach to the assessment and management of activity-related spinal disorders. A monograph for clinicians. Report of the Quebec Task Force on Spinal Disorders. Spine (Phila Pa 1976) 1987;12:S1-59. 18. Nagarathna R, Nagendra HR. Integrated Approach of Yoga Therapy for Positive Health. 3 rd ed. Bangalore, (India): Swami Vivekananda Yoga Prakashana; 2006. p. 4-20. 19. Swatmaram S. Hatha Yoga Pradipika. 2 nd ed. Munger (India): Yoga Publications Trust; 2004. p. 4-30. 20. Nagarathna R, Nagendra HR. Yoga for Back Pain. 2 nd ed. Bengaluru: Swami Vivekananda Yoga Prakashana; 2001. p. 15-30. 21. Vempati RP, Telles S. Yoga-based guided relaxation reduces sympathetic activity judged from baseline levels. Psychol Rep 2002;90:487-94. 22. Fairbank JC, Pynsent PB. The Oswestry Disability Index. Spine (Phila Pa 1976) 2000;25:2940-52. 23. Mehra A, Baker D, Disney S, Pynsent PB. Oswestry disability index scoring made easy. Ann R Coll Surg Engl 2008;90:497-99. 24. Ornetti P, Dougados M, Paternotte S, Logeart I, Gossec L. Validation of a numerical rating scale to assess functional impairment in hip and knee osteoarthritis: Comparison with the WOMAC function scale. Ann Rheum Dis 2011;70:740-46. 25. Gagliese L, Weizblit N, Ellis W, Chan VW. The measurement of postoperative pain: A comparison of intensity scales in younger and older surgical patients. Pain 2005;117:412-20. 26. Spielberger CD. Manual for the State-Trait Anxiety Inventory (Self-Evaluation Questionnaire). Palo Alto, CA: Consulting Psychologists Press; 1970. 27. Spielberger CD, Reheiser EC, Ritterband LM, Sydeman SJ, Unger KK. Assessment of emotional states and personality traits: Measuring psychological vital signs. In: Butcher JN, editor. Clinical Personality Assessment: Practical Approaches. New York: Oxford University Press; 1995. p. 1-7. 28. Hsieh CY, Walker JM, Gillis K. Straight-leg-raising test. Comparison of three instruments. Phys Ther 1983;63:1429-33. 29. Carver A. Pain. In: Dale DC, Federman DD, editors. ACP Medicine. New York, NY: WebMD; 2005. p. 1-18. 30. Tekur P, Nagarathna R, Chametcha S, Hankey A, Nagendra HR. A comprehensive yoga programs improves pain, anxiety and depression in chronic low back pain patients more than exercise: An RCT. Complement Ther Med 2012;20:107-18. 31. Leonard BE. HPA and immune axes in stress: Involvement of the serotonergic system. Neuroimmunomodulation 2006;13:268-76. 32. Telles S, Narendran S, Raghuraj P, Nagarathna R, Nagendra HR. Comparison of changes in autonomic and respiratory parameters of girls after yoga and games at a community home. Percept Mot Skills 1997;84:251-57. 33. Leask A, Abraham DJ. TGF-beta signaling and the fibrotic response. FASEB J 2004;18:816-27. 34. Lokeshwarananda S. Taittireya Upanishat. 1 st ed. Kolkatta, India: The Ramakrishna Mission Institute of Culture; 1996. p. 10-25. 35. Telles S, Nagarathna R, Nagendra HR. Breathing through a particular nostril can alter metabolism and autonomic activities. Indian J Physiol Pharmacol 1994;38:133-37. 36. Shankardevananda S. The Practices of Yoga for the Digestive System. 2 nd ed. Munger, (India): Yoga Publication Trust; 2008. p. 30-45.